A string of tiny islands scattered off the Croatian coast are up for sale. Located along the country's pristine coastline, the islands are said to be attracting attention from people with deep pockets and a taste for privacy. The islands may be strewn with pines and olives but owners will have to pay extra to lease their own beaches, as they remain government property. Property in Croatia, is booming with brokers seeing a 20% rise in prices in some areas in just six months. Croatia's Broker Real Estate are advertising the islands - which include a pair of twin islands and an L-shaped promontory - on their website. 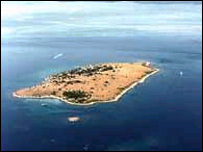 "For your money you get an island in an idyllic setting," Peter Ellis of Croatia Property services told BBC News Online. A 35,000-sq-metre island will set you back 1.5m euros, about £1m. Although he is not managing the sale of the islands, he knows the kind of people who might be interested. "People do ask about them, often celebrities wanting peace and quiet. But they are sometimes put off by the fact that you can't prevent anyone from coming to visit," Mr Ellis said.